As a teenager Liz Van Verth attended Locust Street Art school where she established a foundation upon which she built her career. A native of North Buffalo, Van Verth went on to study illustration at Syracuse University and she earned a master’s degree in digital art from Pratt Institute. Throughout this time, Van Verth never forgot the diversity and freedom that defined her first art school located in a former convent in Buffalo’s Fruit Belt. 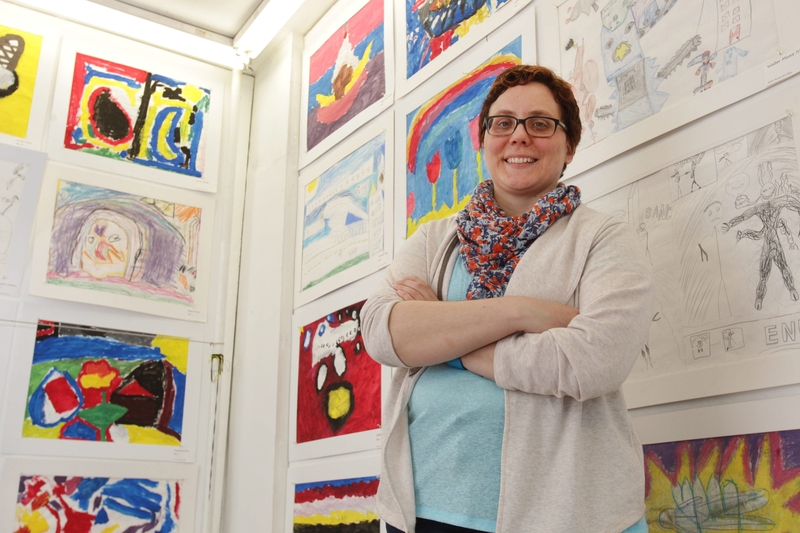 After spending a handful of years teaching animation at Kansas City Art Institute, she returned to her roots in the summer of 2012 and accepted the job as executive director of Locust Street Art. Today Van Verth, 41, supervises a staff of 15 employees who each year work with 2,000 students of all ages. People Talk: How old were you when you discovered your talent? Liz Van Verth: I was always doing something creative. Anything around the house that had to do with decorating was my job – Halloween, Christmas, that sort of thing. I would sit for hours looking at illustrations from children’s books. I was just fascinated by all of it. PT: What led you to Locust Street Art? LVV: My mother. I was 14, and I started off in the same process as what’s being done today. Just draw what you see. Look out the window, pick pieces for a still life. I drew a Christmas cactus plant, I remember, and Molly (Bethel) told me how to finish it. We worked with color mixing. I stayed here for three-and-a-half years. It was a foundation. Anything I’ve done since then I always compared to this place. PT: Did you like animation as a kid? LVV: Anything done by Chuck Jones at Warner Bros. I could recognize the really good stuff from what started in the ’60s and ’70s, when it wasn’t being done as well. PT: What distinguishes good animation? LVV: The character designs are a lot smoother and more interesting to look at. The early cartoons also had more imagination with the storytelling. The later designs simplified the characters too much. They were recycling old animations like Yosemite Sam and putting them into new animations just so they can save money. PT: How did you land a job at NBC studios? LVV: I called everyone I could on a list of contacts I got from Syracuse. One of the contacts was a creative director from NBC, and he brought me in part time to train on their equipment. I did over-the-shoulder graphics for “Nightly News” and the “Today” show. It was all computer generated, and I never liked computers. LVV: I wanted to do everything with my hands. I totally rejected computers. My mother taught computer science at Canisius, and my father taught organic chemistry. I took one computer class in college, and that was it. I really wanted to draw what I saw, but because I was raised with computers my whole life I was able to pick up the NBC equipment pretty quickly. Then they put me on “Dateline,” where I worked for 12 years. I was in my 20s, and it was a very good position to have. LVV: I was losing the creativity, doing a lot of 3-D medical so I decided to go to grad school to Pratt to study computer graphics. PT: How did you land in Kansas? LVV: I really wanted to become a professor. Maybe I could get into being a full-time professor like my parents. That’s what I thought I wanted. I immediately got a position after grad school at Kansas City Art Institute. Moving from New York City to Kansas City, Mo., was hard. I was there about five years helping with their animation program. It was just me and the chair for so long, it was difficult trying to develop a large program. I couldn’t see myself staying there, even though I was on this tenure track. In New York, I could separate myself from NBC and have a life outside of it. In Kansas, I could not escape from being this professor. I couldn’t find that place where I could be me. And then the opportunity came up at Locust Street. PT: Have you made a difference at Locust Street so far? LVV: Yes, in terms of animation programming. It’s exciting to see that. We’re attracting more teens, which is difficult. We draw from the Fruit Belt, the West Side and North Buffalo. It was interesting we were not getting more from the East Side. Now we are targeting that area. PT: How does art study build confidence? LVV: Art is integral to any education setting. I mean I went to City Honors which was definitely math- and science-centered, but it all works together. You can’t be a scientist and not be creative. Art releases all those problem-solving skills. That’s what builds confidence. PT: Where have you made significant inroads? LVV: Cleaning up the building, professionalizing the organization and bringing in fresh blood. The place needed new ideas and enthusiasm. PT: Locust Street Art is in the middle of an urban renewal explosion. Are you concerned for the school’s future? LVV: This place was started after a child asked Molly to teach her to draw. We want to keep that going. We don’t want to become this gentrified privileged neighborhood that changes the constituency we serve. We’re here to serve low-income minority individuals. I really want Locust Street to be this beacon for the neighborhood and for the East Side.